Located in the far southeast of the United States, Florida is a mountain biker’s delight; a state that features an abundance of wooded forests, scenic national parks, marshy swamplands and miles upon miles of gorgeous coastline along the Atlantic Ocean. Within these various terrains are some of the most challenging, picturesque and well-ridden mountain biking courses in the U.S.—five of the most popular of which are featured in below. So, grab your mtb and watch out for the gators. 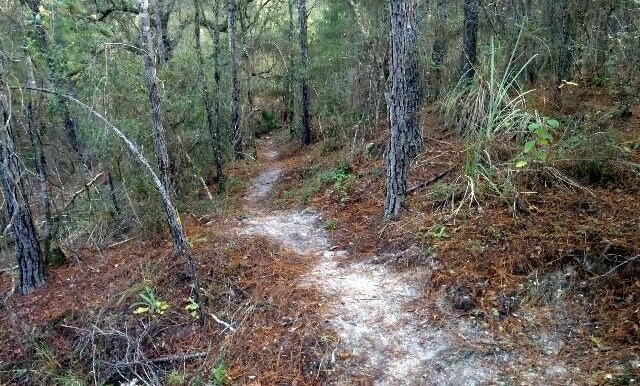 Located in the town of Brandon—in Hillsborough County, Florida—Alafia River State Park’s single track courses are “IMBA EPIC certified,” largely due to the broad range of novice to intermediate trails it offers, as well as several track sections designed for advanced to expert mountain bikers. 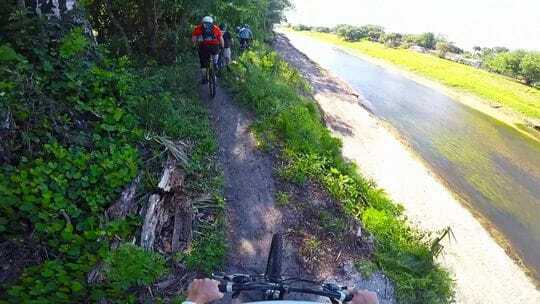 According to rider surveys, the Alafia River State Park trail system is one of the most popular off-road cycling courses in the state of Florida. Riders ranging from beginners to the highly-skilled travel from all over the state to test their chops (and their nerve) on the trail’s compilation of frightening drops, off-camber hillside ledges, high-speed banked turns and daunting ridge-top trails. This single track route, which encompasses twenty distinct trails, is constructed on the rugged landscape of what was once a phosphate mining site, a factor that only adds to the difficulty of an already intimidating course. For the convenience of riders at Alafia River State Park, the trailhead parking lot has bathrooms with hot water, several bicycle rinsing stations, shaded pavilions, and a playground for the kids. Campsites are also available for those looking to spend the night. The many trails at the Santos mountain biking park encompass over 81,000 acres of pure off-road riding paradise. Situated in the city of Ocala, Florida, Santos, which is officially known as the “Marjorie Harris Carr Cross Florida Greenway,” stretches from the Gulf of Mexico to the St. Johns River, occupying a good portion of the land once known as the “Cross Florida Barge Canal.” This 110-mile corridor features a variety of natural habitats and offers a wide range of trails and recreation areas where visitors can experience Florida’s foremost greenbelt. Santos offers courses for beginner, intermediate, and advanced riders, with trails marked yellow, blue and red, respectively. 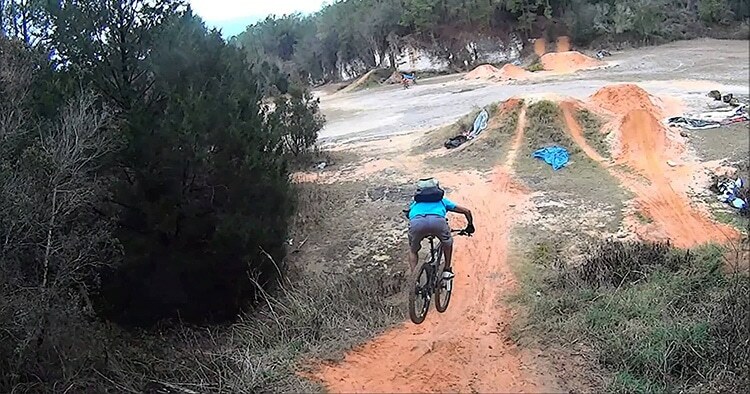 The bulk of the advanced riding is situated on two abandoned mining pits, featuring plenty of drops, tight turns, and menacing, unstable terrain. The large network of trails, consisting of miles of land, can make it easy to get lost on this entertaining route, but thankfully, there are always locals around who are more than happy to steer riders to their desired destination. So large is the Santos system of trails that riders can spend days traversing this course and never tire of the challenges it affords them. Located in Dunnellon, a small city of roughly 2,000 residents in Marion County, Florida, the trail known as Ern N Burn is one of the most-favored courses in this part of the state. The Ern N Burn trail is situated on what appears to be the diggings of an old barge canal. It is constructed to incorporate a number of obstacles and challenges, including drops, rough terrain and plenty of bench cuts. Due to the shakiness of the earth that makes up the trail, it is reinforced with shell in many areas. Because the trail takes advantage of the diggings there is plenty of quick elevation changes and nice flow from start to finish. 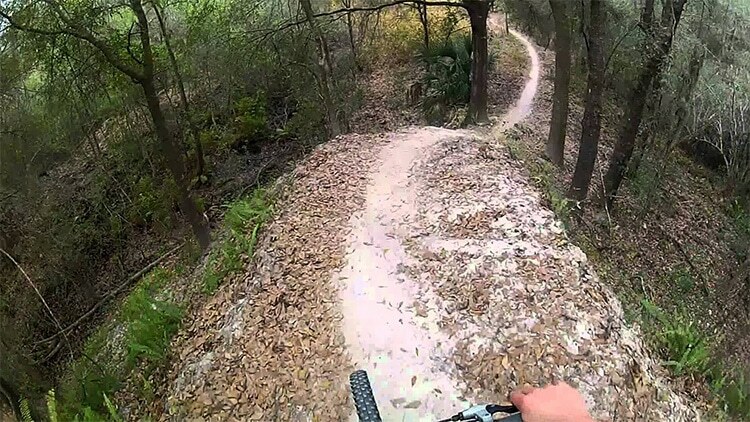 Balm Boyette Scrub Preserve, located in the large Florida city of Tampa, is a mountain biking park that was built and continues to be maintained by SWAMP—the local mountain biking advocacy group. The trail system of Balm Boyette Scrub Preserve includes roughly 25 miles of single-track, plus about 12 miles of double-track used to access or unite the single-track courses. The fun and challenging single track course begins approximately 2 miles in from the parking lot region. One of the favorite tracks at the Balm Boyette Scrub Preserve is the 2.2 mile Ridgeline Trail, which was completed in December of 2008. A very distinctive trail by Florida standards, the trail features long, straight descents, with a clean run-out at the bottom of the course. Curves of the trail are fast and banked, and the majority of roots and rocks have been removed to keep the surface as rapid as possible. There are also several drops in which riders can reach over 30 miles per hour. The park itself is situated on 4,900 acres of upland scrub, located just south of Brandon, Florida. About a dozen or more lakes on these trails populate rolling grasslands at the far eastern end of the property, with the remainder being heavily covered with scrub-oak and pine. From beginner to advanced courses, Boyette has something for everyone to enjoy. Although certainly not a long track, Grapefruit Trail offers a half mile of intermediate to advanced track. The flowing trail surrounds a dirt jump track filled with hips, transfers and double-backs. Once riders complete the initial beginner-level adjacent to the parking area, they are treated to a mostly-downhill course filled with many challenging options and obstacles, including ride drops, tabletops, gap jumps, step-ups, berms, and various jump lines. All trails are well marked, helmets are required, and caution is always recommended.